CCA has always been a strong and consistent force in preserving the natural environmental integrity of our watersheds. We simultaneously strive to protect the natural qualities of rivers and their tributaries in the Mid-Atlantic region, and work to preserve paddlers’ rights of access on these rivers. 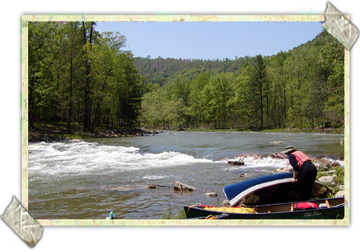 CCA founded the Potomac Conservancy, and co-founded the West Virginia Rivers Coalition. Three of our Conservation Chairs, Courtney Caldwell, Steve Taylor, and Pope Barrow, have received the National River Conservationist of the Year Award from Perception, Inc. Working with government agencies, conservation organizations, and community- based watershed groups, CCA’s conservation-minded members continue the battle against degradation of the natural environment along CCA’s favorite rivers and tributaries. We support preservation of natural forests, streamside buffer zones, stormwater management, watershed clean-up efforts, and streamside restoration with native species where needed. It's easy to slice off a piece of conservation. Many of our conservation volunteers work on discreet projects, which are very helpful and which make a real difference - even if they can put in only an hour or two per month. CCA participates in the Annual Potomac River Watershed Clean-up organized by the Alice Ferguson Foundation, and organizes CCA clean-up trips on parts of the rivers that can only be accessed by small boat. In our everyday paddling activities, CCA trip leaders and individual paddlers consistently make the extra effort to pick up trash along the streams and at river access points. Communicating with other CCA members and others to inform them of new conservation and environmental threats. Assisting fund raising activities to benefit organizations that work on protecting our local rivers. Assisting with river cleanup programs. Contacting Congress, your state, and local governments: tell your congressional representatives and local legislators how you feel about river conservation issues. Working with a local watershed group to stay informed of the issues in your neighborhood. Organizing a stream or river clean-up. Always demonstrating positive environmental citizenship while using rivers.